Yesterday, I had a couple of hours en route to Lyon’s St Exupery Airport to stop and draw breath as a frenetic month of travel and work drew to a close. I drove to Grignan, a gem of a Provencal country town that could have come straight out of a Peter Mayle novel. I parked the rented Polo in the cobbled main street and had a look round. First, a Caveau des Vignerons to taste and buy a few bottles of local red wine. 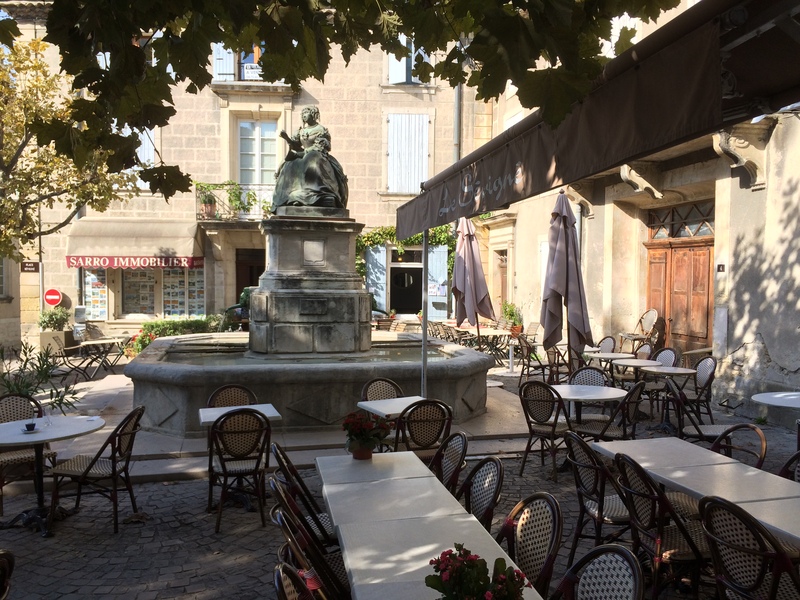 Then, I sat for half an hour reading my book and enjoying a café au lait in the main square, where I later had a delicious plat du jour of a goat cheese, sprout and spinach salad followed by fresh cooked tuna with polenta for lunch at the gloriously named Restaurant Lulu Hazard. Beside me, the bronze statue of Marie de Rabutin-Chantal, Marquise de Sévigné, after whom the square was named, glowed softly in the sunlight. How refreshing, I thought, to see the gentle, contemplative figure of this 17th Century woman of letters celebrated at the heart of the community, instead of some fusty old general. A few pedestrians passed by, deciding where to take lunch, but otherwise the square was tranquil. Until the town clock struck one (twice, for some arcane reason peculiar to French horology) disturbing a small flock of roosting pigeons who took it as their signal to flap across the square and take refuge on the opposing rooftops. I needed only one more thing to confirm that I had found my way to heaven and there it was on the other side of the square: Ma Main Amie, a tiny bookshop selling both second-hand books and exquisite new handmade editions of stories and poetry. I bought three slim volumes (conscious of how painstakingly I read French): a new letterpress pamphlet of Paul Celan’s Entretien dans le montagne with uncut leaves; the Elegies of Anna Akhmatova in Russian and French; and a nice hardback reproduction of an eccentric 19th century fairy tale by Alphonse Karr. They will take me ages to work through, dictionary in hand, but that’s not the point. They are small treasures and I was very happy to give Mme Lefebvre, the owner of the shop, 35 Euros for them. Of course, I was conscious of how much Chris would have loved it. But, instead of her absence triggering my grief, imagining her enjoyment only added to my delight. I felt light and easeful and that I wasn’t (as I’ve often felt since Chris died) a pretender in my own life. I was there in my own right. I became aware of the figurative breath I had stopped in Grignan to draw and I began literally to breathe more deeply once more.